(Santa Ana, California) January 16, 2019 – Professional Coin Grading Service (www.PCGS.com) has added an intriguing and exciting new element of competition and additional awards to its popular PCGS Set Registry®. 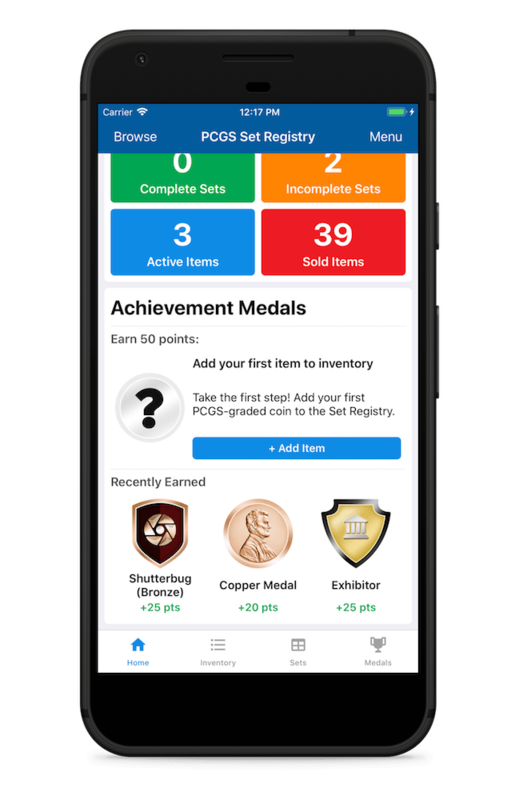 “It’s called the PCGS Set Registry Achievement Program (www.PCGS.com/setregistry/mysetregistry), and it challenges current and new PCGS Set Registry members to earn points and accumulate digital achievement medals for their efforts. There also is an opportunity to win numismatic prizes valued at $500 or more during the first ten days of the program’s launch,” said Cosetta Robbins, Manager of the PCGS Set Registry (www.PCGS.com/setregistry). The PCGS Set Registry was established in 2001 and now hosts over 95,000 U.S. and world coin sets. It is easy and free to become a member. “There is a lot of opportunity to grow the Set Registry program and this is a step in the right direction particularly as we look at new ways to engage collectors of all experience levels,” said PCGS President Brett Charville. The achievement program was officially launched on January 14, and now through January 25, 2019, PCGS is conducting “10 Days of Giveaways” with special awards for successful participants. Each day there is a specific action to complete to earn a medal, and one lucky collector who shares their medal of the day on social media will win a special reward. For example, on the first day, users were required to download the PCGS Set Registry app to earn the Mobile Mogul medal for the chance to be put in the running for an 1882-S Morgan Dollar graded PCGS MS67. Each day’s numismatic prize will have a minimum value of $500. Community – the act of connecting with fellow collectors on the Registry. The medals and points will add up over time and be stored digitally on the Set Registry dashboard. Every collectible you add to the PCGS Set Registry will move you toward a series of rewards. With every completion within the Set Registry, you will boost your medal count and point total. These medals and points will allow collectors more opportunities for achievement and recognition instead of reserving the celebrations for the Annual PCGS Set Registry Awards Luncheon. Follow @PCGScoin on social media to learn what action and prize will be offered each day. The forums at PCGS.com will also post daily updates as well as the PCGS blog at https://forums.collectors.com/discussion/1012295/pcgs-set-registry-10-days-of-giveaways-updated-daily.